Yoga is an traditional form of exercise that originated in India. Yoga aims to bring harmony in your life by putting your whole body in sync, mind, body and soul. There are a lot of types of yoga that you can try. The first time I wet to a yoga class, I was confused after. I didn't know if I'm doing any of the poses right. It didn't felt anything. My mind, body and soul was so out of sync. But after a few classes, I was able to sync my body through breathing exercises. Once I found my rythm, every yoga class was as effective as a 1 hr Zumba class. I was perspiring like crazy despite the limited flow of movements. I was not the only one who fell in love with yoga that time. 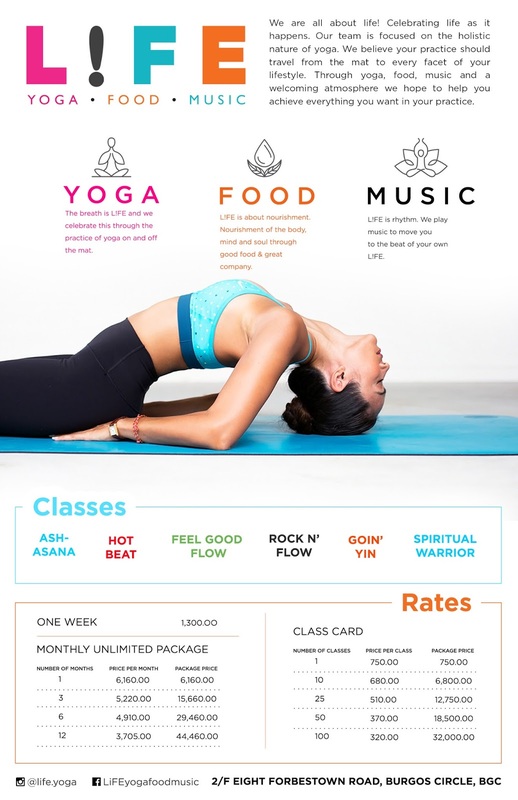 Almost immediately, a lot of yoga studio opened and Yoga was on the rise. Most women, like me loved yoga to every bits. Life! 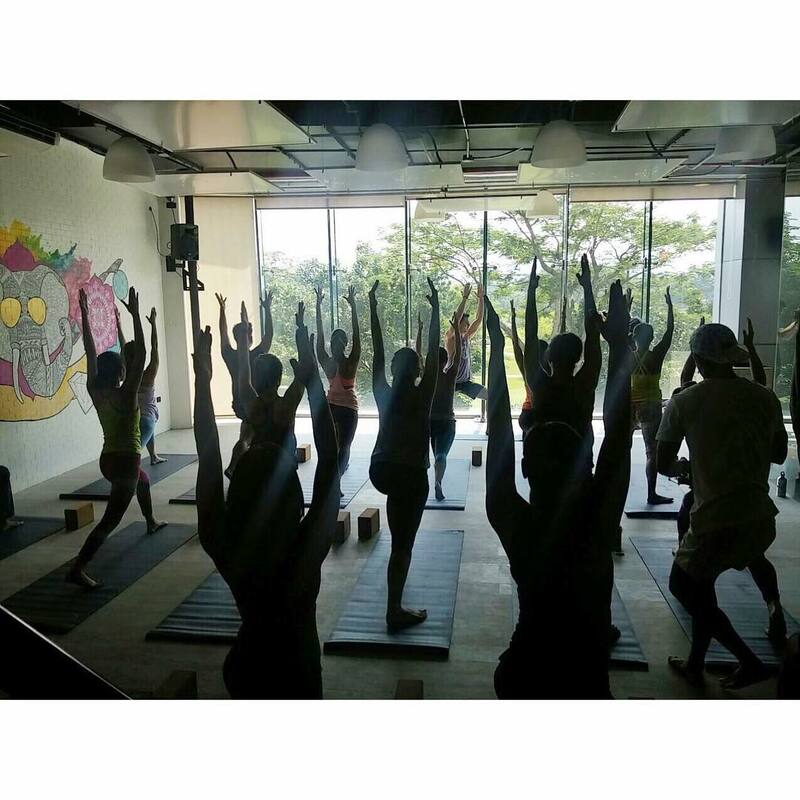 Yoga is one of the newest yoga studios that opened along Forbestown BGC. 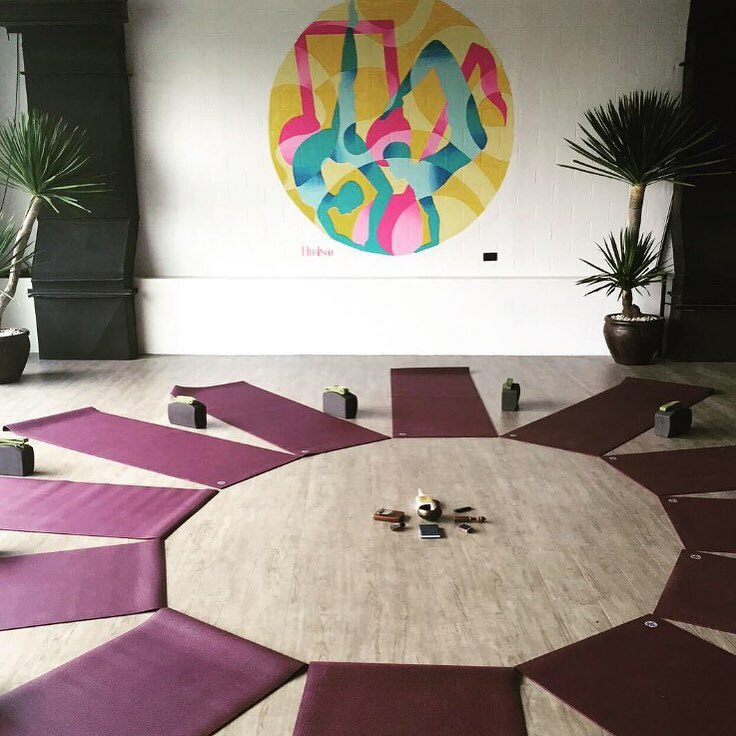 It combines three of our favorites, yoga, healthy food and music.It is a quaint yoga studio that exudes a vibrant vibe. They have 2 studios where yoga classes are conducted. 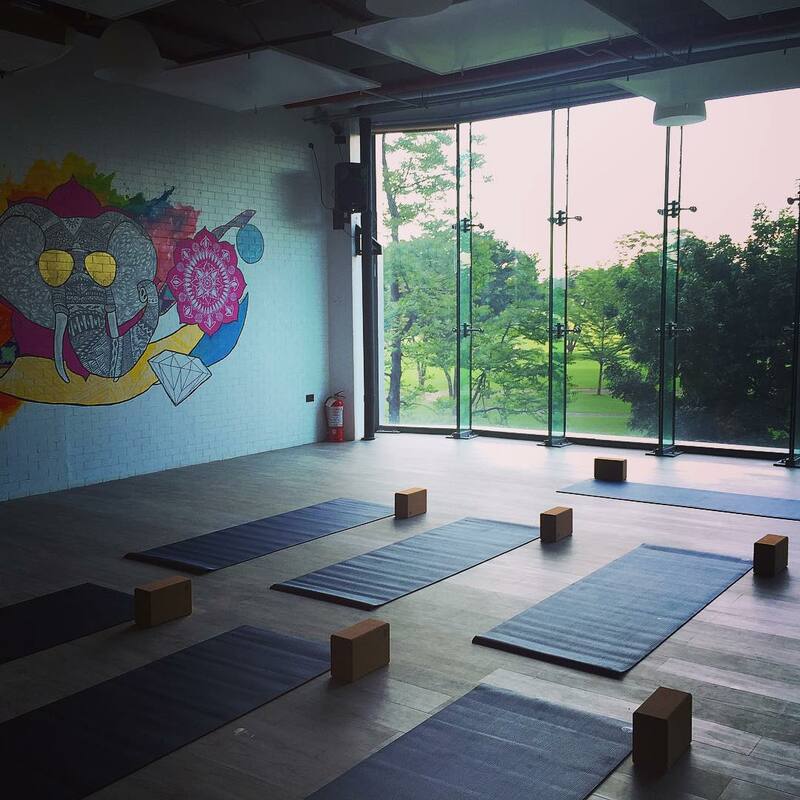 One studio for regular yoga classes and the other studio is a heat controlled room, specially designed for hot yoga classes. What is amazing is that their yoga studios has glass walls from floor to ceiling, giving you a greener view of The Fort. 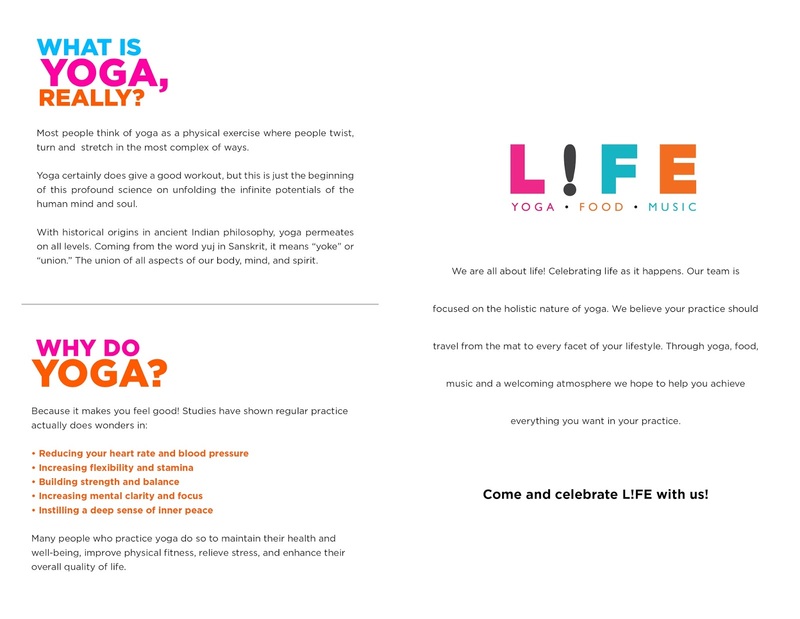 Life Yoga has six types of classes that you can attend namely, Ash-asana, Hot Beat, Feel Good Flow, Rock N' Flow, Going Yin and Spiritual Warrior. Their rates are competitive among other studios. I went in to try the Rock N' Flow class one evening with Team Aldous. I was excited because it's been months since I went to a yoga class. My body is so out of sync already and I was looking forward for a nice burn and stretch. The class went on for almost an hour and I even wanted more. I was enjoying the sun salutation and warrior poses! Overall, I still love Yoga among all the exercises I've tried. It keeps you in tune with your body and at the same time calms your nerves. I know a lot of people who find yoga boring and does no bring some heat in the body. I say that if you get the flow, you'll keep your body warm and you'll definitely sweat more in just few moves. I'm looking forward to try the Hot Yoga class so I could burn more fat from the extra heat from the room. What is your favorite Yoga pose/sequence?